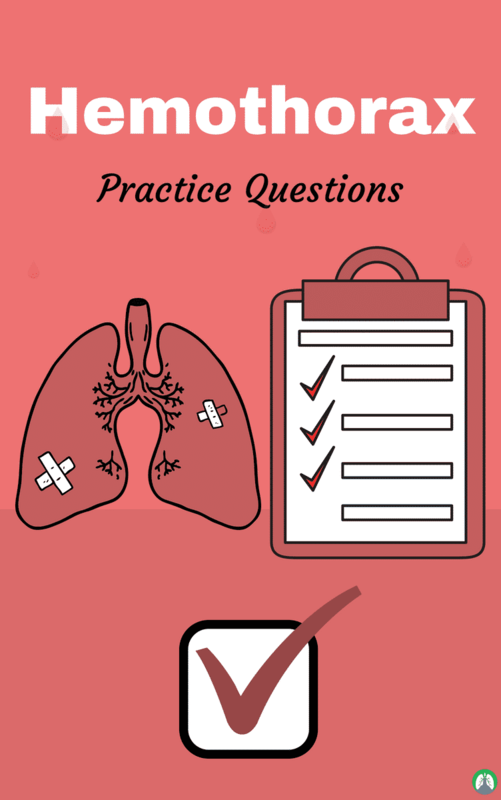 If you’re a Respiratory Therapy student looking for Hemothorax Practice Questions then you’ve definitely come to the right place. That’s because, in this study guide, we have listed out several of them for you here. A hemothorax is basically an accumulation of blood in the pleural cavity and is definitely something you should know about as a Respiratory Therapist. Not to worry, because if you go through the practice questions below, you should easily develop a good understanding of a Hemothorax. So are you ready to get started? 1. What is a hemothorax? It is an accumulation of blood in the pleural space. 2. What will the general appearance of patients with hemothorax be? Cyanotic, tracheal deviation/mediastinal shift away from the affected area, and bruising over the affected area. 3. What will the respiratory pattern look like for patients with hemothorax? Tachypnea and a productive cough (hemoptysis). 4. What type of breath sounds will you hear for patients with hemothorax? Diminished or absent on the affected side. 5. What will the chest percussions for patients with hemothorax? Flat/dull percussion note on the affected side and decreased tactile and vocal fremitus. 6. What type of diagnostic testing should be done for a hemothorax? Chest x-ray, ABG, and CBC. 7. What will the chest x-ray look like for a hemothorax? Increased radiodensity, increased whiteness, and a tracheal shift away from the affected side. 8. What will the ABG look like for patients with hemothorax? 9. What will the CBC be like for a hemothorax? 10. What is the treatment for a hemothorax? Thoracentesis or chest tube to drain blood, oxygen for hypoxemia, hyperinflation therapy and MV with PEEP for acute vent failure. 11. What is the etiology of a hemothorax? Blood accumulation in the space between the chest wall and lung (pleural cavity), often caused by trauma but is also frequent complication following cardiac or thoracic surgery. 12. What is the chief complaint of a hemothorax? 13. What would the physical exam be like for a hemothorax? 14. How is a hemothorax diagnosed? 15. What is the past medical history of patients with hemothorax? 16. What are the vital signs for a hemothorax? 17. What cough is manifested by patients with hemothorax? 18. What is the appearance of the chest for a hemothorax patient? Tracheal and/or mediastinal shift away from the affected side, bruising over the affected area. 19. What is the hemothorax respiratory pattern? Tachypnea and dyspnea depending on severity. 20. What is the color of patients with hemothorax? 21. What are the typical breath sounds for a hemothorax? Diminished or absent on affected side, possibly pleural friction rub. 22. What assessment data would indicate that the chest tubes have been effective in treating a patient with a hemothorax who has a right-sided chest tube? There is gentle bubbling in the suction compartment. There is no fluctuation in the water-seal compartment. There is 250 mL of blood in the drainage compartment. The client is able to deep breathe without any pain. 23. What is the overview for a hemothorax? Blood in the pleural cavity and may result in lung collapse. 24. What is the pathophysiology of a hemothorax? Damaged intercostal, pleural, mediastinal, and sometimes lung parenchymal vessels cause blood to enter the pleural cavity. The amount of bleeding and the cause is associated with varying degrees of lung collapse and mediastinal shift. 25. What are the causes of a hemothorax? Anticoagulant therapy, blunt or penetrating chest trauma (most common cause), central venous catheter insertion, damaged intercostal, pleural, or mediastinal vessels; damaged parenchymal vessels, dissecting thoracic aneurysm, heart or thorax surgery, hereditary hemorrhagic telangiectasia, necrotizing infections, neoplasm, pulmonary arteriovenous fistulas, pulmonary infarction, thoracic endometriosis and tuberculosis. 26. What is the incidence of a hemothorax? 27. What are the complications of a hemothorax? Mediastinal shift, ventilatory compromise, lung collapse, cardiopulmonary arrest, pneumothorax and empyema. 28. What is the patient history of a hemothorax? Recent trauma, recent thoracic surgery, metastatic disease, chest pain and dyspnea. 29. What are the physical findings of a hemothorax? Tachypnea, dusky skin color, diaphoresis, hemoptysis, restlessness, anxiety, cyanosis, stupor, affected side may expand and stiffen. The unaffected side may rise with gasping respirations, dullness over the affected side, decreased or absent breath sounds over the affected side. Symptoms associated with blunt trauma such as bruising, tachycardia and hypotension. 30. What diagnostic laboratory results would be found in patients with hemothorax? Pleural fluid analysis shows hematocrit greater than 50% of serum hematocrit. Arterial blood gas (ABG) analysis may show the increased partial pressure of carbon dioxide and decreased partial pressure of oxygen. Serum hemoglobin level may be decreased, depending on blood loss. 31. What diagnostic imaging results would be found in patients with hemothorax? 32. What would the results of a thoracentesis be for a patient with a hemothorax? 33. What are the treatment methods for a hemothorax? Stabilization of the patient’s clinical condition, stoppage of bleeding, thoracentesis, insertion of a chest tube and auto-transfusion if blood loss approaches or exceeds 1. 34. What medications should be given for a hemothorax? Oxygen, analgesics, and IV fluid therapy. 35. What are the expected outcomes of a hemothorax? Express feelings of increased comfort and decreased pain. Express feelings of reduced anxiety. Maintain fluid volume balance. Maintain adequate ventilation and oxygenation. Maintain effective breathing pattern. Maintain adequate cardiopulmonary perfusion. Remain free from signs and symptoms of infection. 36. How should the respiratory therapist help treat patients with hemothorax? Recommend analgesics as ordered. Institute comfort measures and help the patient relax. Auscultate lung sounds for changes. Give prescribed oxygen based on oxygen saturation levels. If indicated, assist with chest tube insertion, ensure the tube is attached to a closed drainage system, and arrange for chest X-rays to evaluate chest tube location. Ensure follow-up chest X-ray after removal of chest tube. Change the chest tube dressing and provide chest tube care, as needed. Maintain underwater chest tube drainage as indicated. Prepare the patient for surgery, if needed. Obtain specimens for laboratory testing, such as ABG analysis and complete blood count (CBC). 37. What should be monitored on patients with hemothorax? Vital signs, intake, and output, chest tube drainage, cardiopulmonary status, closed drainage system function, hemodynamic parameters, ABG results, chest X-ray results, CBC results, complications and signs and symptoms of infection. 38. What causes blood in the pleural space? 39. What will be the suspicion for patients with severe chest pain after a trauma? 40. How will the tactile and vocal fremitus be for a hemothorax? Vibration on talking will be decreased. 41. Is there a pleural friction rub on patients with a hemothorax? Yes, it might be heard since the pleural space will be filled with blood. 42. What is used to drain fluid from the lungs? So there you have it! I hope these Hemothorax Practice Questions were helpful for you. As I mentioned before, you will definitely need to know all about Hemothoraces as a Respiratory Therapist and what better time to start learning than now. Use this information wisely and I wish you the best of luck. Breath easy, my friend.